Oh, the post-vacation blues. It's a real phenomena that includes daydreaming about your wonderful New Orleans trip, wondering why you're not eating more beignets and wishing that all your laundry would do itself because the wash machine is, of course, broken down at the mere sight of Mt. Washmore with the repair people no less than five days out. Perfect. I had a miserable run this afternoon. It was the longest, most painful nine-miler I've ever had. I blame it on the beignets, pralines, po'boys and alligator. Don't worry, I have awesome photos to share at a later date. After wrapping up my last long run before the Fort2Base Race in a time that's too embarrassing to post, I sat in my first ice bath and contemplated dinner. Another symptom of the post-vacation blues is the complete lack of groceries and an even greater lack of interest in getting groceries. Going to a restaurant while on vacation is so easy, after all. 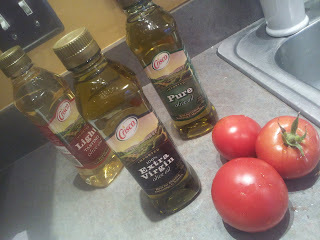 I had some olive oil from Crisco to try out as part of the Foodbuzz Tastemaker program. Paired with the tomatoes I finally have bursting from my modest little garden, I was ready to go. 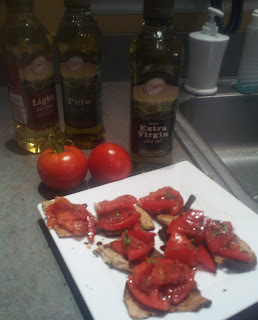 I toasted a sandwich thin, then rubbed it with a garlic clove, topped quartered pieces with a sliced, fresh tomato and a julienned sprig of basil from my garden, then hit the slices with the Crisco Extra Virgin Olive Oil, balsamic vinegar and a little sea salt. 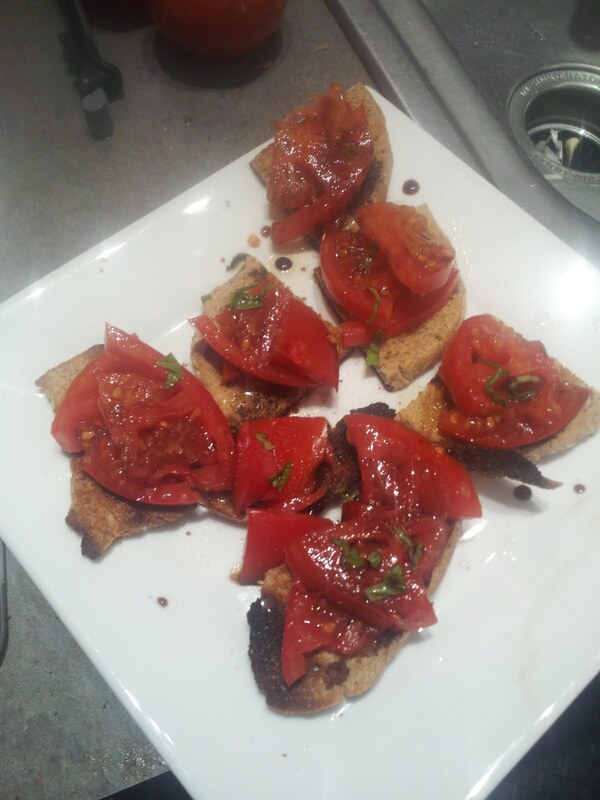 Maybe I was hungrier than I thought, but this bruschetta totally hit the spot. The carbs from the bread were aw esome post run, and the fruity flavor of the olive oil really set off the tartness of the balsamic and complimented the fresh flavor of my tomatoes. I'm looking forward to using the other Crisco samples in my baking. I got a sample of the Light Olive Oil, which is designed for baked goods and frying (which then makes my fried food and cookies healthy, right?) and the Pure Olive Oil, which I hear is tasty for roasting a grilling. Here's hoping the weather holds out so I can get some more grilling in!